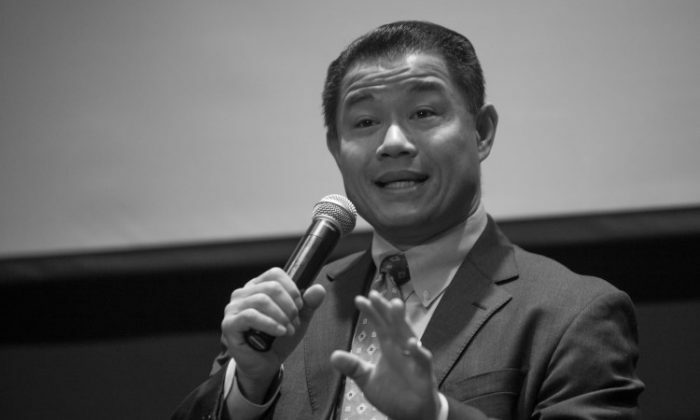 NEW YORK—Evidence submitted for the trial of John Liu’s campaign aides shows Liu’s interest in Xing Wu (Oliver) Pan’s role in the Fukien American Association—a group with ties to both organized crime and the Chinese regime. Pan was a fundraiser and Jia (Jenny) Hou was the treasurer for Liu’s 2013 mayoral campaign. Both are being charged for trying to defraud New York City by recruiting straw donors to get illegal public matching funds for Liu’s campaign. Hou is facing additional charges for lying to the FBI and withholding evidence. On July 27, 2011, Pan met with an undercover agent, John Chiue, who was posing as a Chinese businessman by the name of Richard Kong. Chiue said he was interested in starting a business in New York City, and told Pan he wanted to get a politician from City Hall in his pocket so he could make calls down the road and clear up any red tape. John Liu was elected comptroller in 2009. During the meeting, Pan told Chiue about a phone call he had with Liu. “Usually my first question will be ‘John, how much money you need?’” said Pan, in a transcript of a video Chiue took with a hidden camera. Liu said he would need 4 million or 5 million dollars, according to Pan. Although Pan was only described as a businessman during the trial, he is also the executive vice chairman of the Fukien American Association, as well as the United Fujianese American Association. The Fukien American Association had raised $70,000 for John Liu’s comptroller campaign by July 2, 2008, according to Chinese state-run newspaper World Journal. The Fukien American Association is affiliated with the Fuk Ching gang, known for its involvement in human trafficking, extortion, and protection rackets, according to a report “Chinese Transnational Organized Crime: The Fuk Ching” by James O. Finckenauer, Ph.D., at the National Institute for Justice, which is a branch of the U.S. Department of Justice. The Fukien American Association is also one of the main organizations in Chinatown that organizes events for visiting officials of the Chinese Communist Party. Liu’s dealings with the association have continued in his 2013 mayoral campaign through Pan. According to one of the prosecutors at Pan and Hou’s trial, Justin Anderson said, “The campaign strategy” for Liu’s 2013 campaign “was to get small donations” on a large scale, and to get public matching funds from these donations. On July 18, 2011, Pan and the undercover agent, Chiue, met at Pan’s property in New Jersey. Pan explained how he could arrange an event where they could use straw donors to funnel contributions into John Liu’s campaign. “I’ll call John directly,” Pan says. The fundraising event took place on Aug. 17, 2011. Pan used the money given to him by Chiue, and also came through with arranging a private meeting between John Liu and Chiue, which the undercover agent requested as a requirement for the deal. When Oliver Pan and John Liu met, they hugged. During a call between Pan and Chiue on Oct. 13, 2011, Chiue asks Pan if there is a better way to funnel contributions into Liu’s campaign. Pan tells him if they have a large event, with a bill of $30,000 or $40,000, then Chiue can pick up the tab. “Would John know that I took care of it? That it came from me?” the undercover agent asks. In the trial of Pan and Hou, closing arguments were made on Wednesday, May 1. The jury was in deliberations at press time. The smaller charges against comptroller John Liu’s former treasurer were brought up during trial on Friday and Monday in Manhattan's Southern District federal courthouse.